his class is a container for an histogram. This class uses an map to store histogram. If your histogram is dense use DenseHistogram. You should access each bin by (InstanceIdentifier)index or measurement vector. Definition at line 36 of file itkSparseFrequencyContainer.h. Definition at line 43 of file itkSparseFrequencyContainer.h. Definition at line 62 of file itkSparseFrequencyContainer.h. 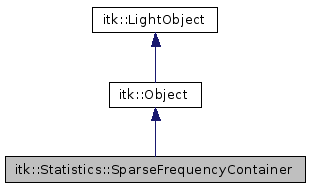 Definition at line 60 of file itkSparseFrequencyContainer.h. Definition at line 54 of file itkSparseFrequencyContainer.h. Definition at line 47 of file itkSparseFrequencyContainer.h. Definition at line 42 of file itkSparseFrequencyContainer.h. Definition at line 40 of file itkSparseFrequencyContainer.h. Definition at line 41 of file itkSparseFrequencyContainer.h. Definition at line 57 of file itkSparseFrequencyContainer.h. Definition at line 89 of file itkSparseFrequencyContainer.h. Method to get the frequency of a bin from the histogram. It will return zero when the Id is out of bounds. Definition at line 84 of file itkSparseFrequencyContainer.h. Method to increase the frequency by one. This function is convinent to create a histogram. It returns false when the id is out of bounds. Calls the SetToZero method of superclass to initialize all the bins to Zero. This should be done before starting to call the IncreaseFrequency method.